Don't miss out on this fun workshop! Learn what Deke Sharon from Pitch Perfect calls the blackbelt of a cappella!! Teachers: You are welcome to join your students for this fun learning experience! 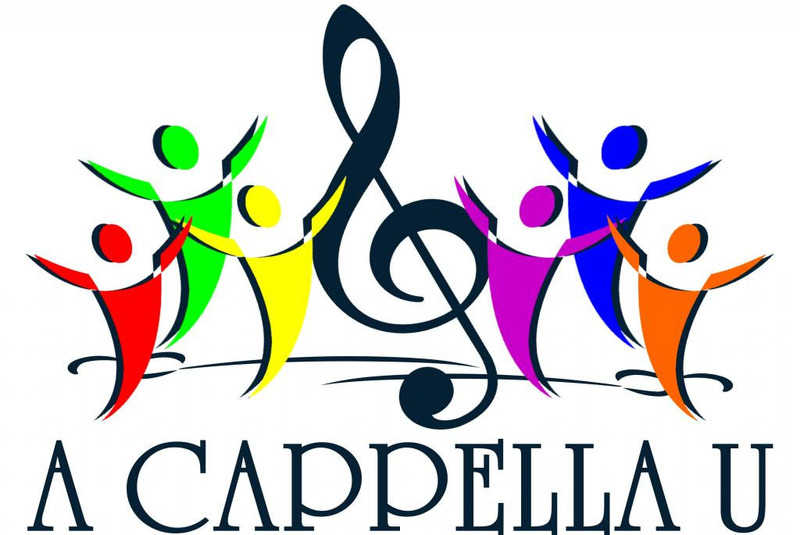 You will be able to see first-hand how a cappella 4-part harmony works to ring chords. Plus lunch is included! Please register below and in the drop down menu under payment, select Teacher. This will give us an accurate food count. Thank you. 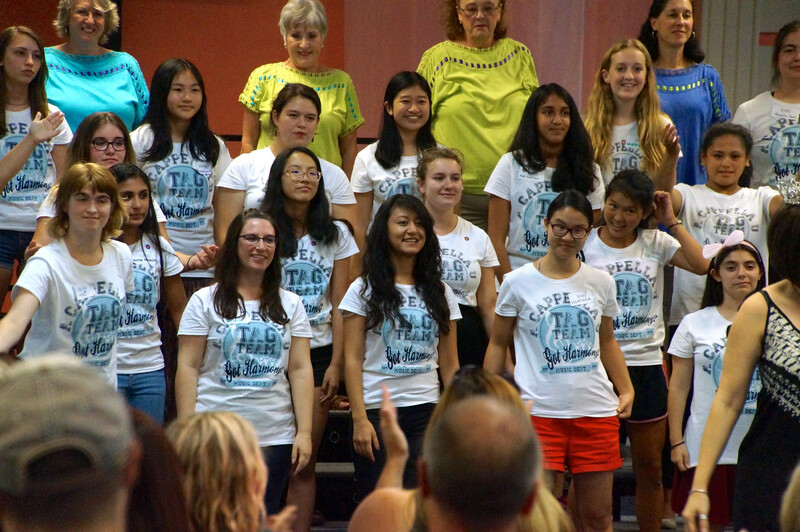 A Cappella U is an all day Saturday workshop for young women between the ages of 13* and 25. All vocal ranges are welcome and experience is not necessary. 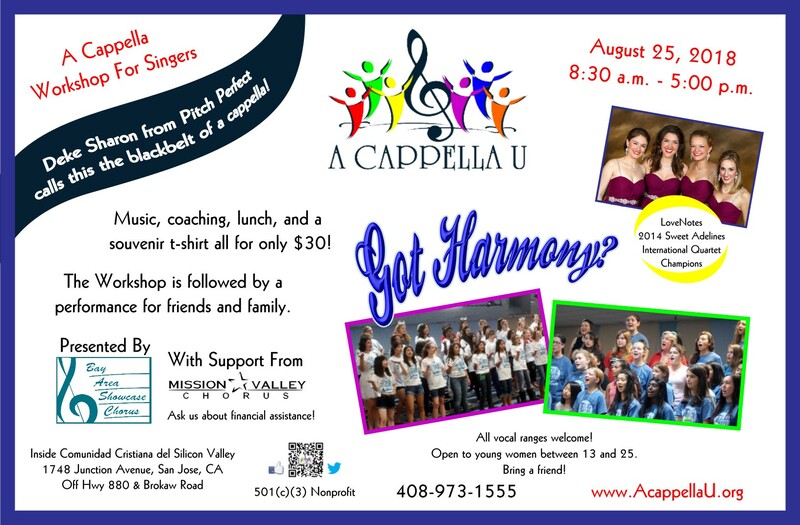 Bring a friend and share this fun day singing a cappella harmony! Students will learn music in 4-part harmony from our 2014 Sweet Adelines International Champion Quartet, LoveNotes, and fun choreography from a professional dance instructor. At the end of the day, students will be able to participate in a show for their friends and family! The show will start at 4:30 p.m. Lunch and a souvenir t-shirt are included! Off Hwy 880 & Brokaw Road, 1/2 block behind Fry's. Take the driveway next to 88Bistro all the way to the back of the complex. *Participants must be 13 yrs old by August 25, 2018. Exceptions will be considered by the music team. Please email AcappellaU@singharmony.org for details. Participants under 13 years old must have a chaperone present for the duration of the event. Financial assistance available - just ask us! See LoveNotes, your workshop leaders, in action! And thank you to our sister chorus, Mission Valley Chorus, for their support and assistance in making this event happen!